I really didn’t mean to wait a week to get to part two, but it was a busy week! I did some thrifting and found a nice set of flatware that I was pretty excited about. Do you see why I’m excited? No, not all flatware commands such prices, but this one in particular is pretty popular. It’s by Oneida and it’s called Will O Wisp. This is from the Heirloom line and you’ll know Heirloom pieces by the ‘cube’ mark on the back. Always worth picking up and sometimes a major score! So in this case, I already knew the pattern when I spotted it in the thrift store bins, but what do you do if you find flatware and don’t know the pattern? I’ll give you my process and see if it helps for you. First of all, I have to share a purchase I made that was a game changer for me and selling stainless flatware. I bought the Stainless Flatware Guide that is put out by Replacements.com. Not sure why I waited so long since it saves me so much time. It’s arranged by maker and broken down even further by backstamp. It’s so easy to do a quick scan through the book! Probably about 75% of the time I find the pattern quickly. Maybe even a higher percentage. Most of the time I start my search on Ebay itself. I check out the mark on the back. Sometimes there’s something a bit different on the back that might help me narrow it down. For example, if the back says Oneida Community Stainless, there are going to be 1000s of listings on Ebay and I don’t really want to scroll through them all. But, if the back says Oneida Premier Stainless…that just may be a word that other sellers will have put in their title. I do a quick search and sometimes find it pretty quickly. Love it when that happens! If not, next step is to go to the Replacements.com website. My first step there is the Search box in the top right corner. I enter anything that might make the pattern stand out. “Oneida Premier”, “Oneida roses” “Reed & Barton China”. So it could be a word on the backstamp, the country it was made in, or some distinguishing feature on the flatware itself. Again, sometimes you hit it quickly. If not, then next, there’s nothing left to do but scan through all the patterns by that maker. But there are still tricks. When you click on the “Silver” tab at the top of the main page, you’ll get a big list of makers, starting with the A’s. Use the alphabet at the top to get to the right page quickly. Then scroll down to find your maker and click on it. Make sure you click on “Photo View” not “List View” so you can get to a screen that looks like this. Okay, this part can get a bit tedious. Because there might be PAGES to scroll through and look at. Your eyes may cross. 🙂 Hopefully your pattern will start with an A and not a Y!! QUICK TIP: Hit CTRL and + at the same time to increase the size of the text on your screen. I use Chrome, so you may need to Google how to do that on your browser. This gets the pictures bigger and easier to scan. I have another little trick I use when I have to scan through pages of patterns. Check the shape of the end the handle. Pointy? Square? Oval? Then I just let my eyes scan and only focus on patterns with that same shape! So honestly, I know flatware is not for everyone. No worries! If this doesn’t appeal to you at all…don’t fret! I personally love the research! The flatware book has made it easy so sometimes I miss the search. But I’m weird like that! The part I really struggle with is organization. So that will be Part 3! Stay Tuned! Sure thing! Glad it could help! hi – looking for help identifying some flatware and hoping you want a challenge 🙂 I’ve been looking for 5+ years. have tried Replacements, but nothing…. Sorry for the delay in seeing this! I will shoot you an email. I am in the same boat… have been trying for a few years to identify a pattern without luck. It has a backstamp on it, but I am unable to figure out what company the stamp belongs to. If you want a second challenge, I would also love the help! 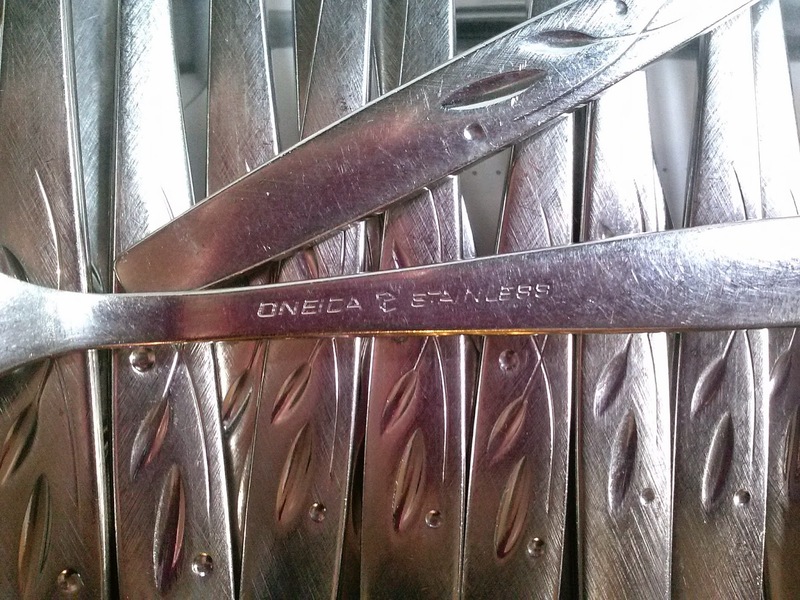 How can I tell from the backstamp if an Oneida piece was made before the 2005 switch to Asian manufacture? This may not be true of all Oneida patterns, but there are definitely some that are marked Oneida USA. Patterns like Flight and others that are still being made. I make sure to put the USA part in the listing because for some buyers..they look for that. The heft and feel of the flatware will match what they already have. I’ve seen on newer pieces…a small printed “Indonesia” or “Vietnam” up near the back of the bowl. Honestly though, new and old Oneida seems to resell well, especially if you find it inexpensively enough. Do you know the name of the pattern in the picture of your title to this page? That is the same as mine and the one I am looking for. Thank you! That is Oneida Bancroft. Very popular!